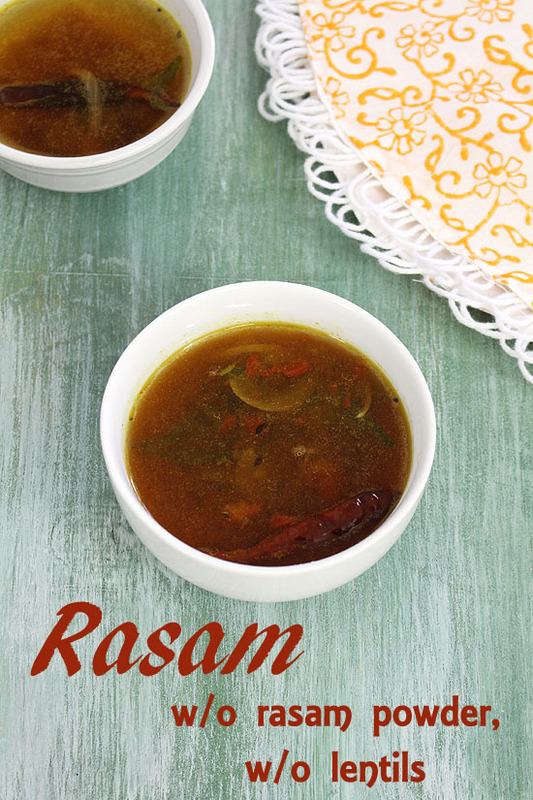 Rasam recipe – This is an integral part of the South Indian meal. It is not complete without a bowl of rasam on side. Good to have it when you are feeling cold or having sore throats. The main flavor ingredient for making it PERFECT is tamarind. It adds the needed sourness to the dish. There are many different variations in making rasam recipe. The one I have shared today is the easiest one that you cannot go wrong with it. At home, I occasionally make rasam since we both are loving different verities. Now the weather starts to get chilly, I enjoy it a cup of it as such in the morning. Lately, hubby is enjoying a bowl of it with quinoa. Yes he replaced the rice with cooked quinoa and he said it was the BEST. 1) First take tamarind in a bowl and add hot water in that. Let it soak for 15-20 minutes. 2) Then squeeze and extract the pulp. Strain the mixture. 3) While the tamarind is soaking, Using mortar and pestle, make the powder from black peppercorns and cumin seeds. 4) Alternately you can use the spice grinder. 5) Now take tamarind water in a pan. 6) Add sliced onions, crushed tomato, green chili and chopped coriander leaves. 7) Also add salt, red chili powder, turmeric powder and above prepared pepper-cumin powder. 8) Add another 2-3 cups of water and turn the heat on medium. Adjust the water as per the sourness of your tamarind. So taste the tamarind water and if it is too sour then add more water, if less sour then add less water. So adjust accordingly. 9) Let it come to a boil and then simmer for 5-6 minutes. NEVER simmer for longer period of time. It should be simmered just till the rawness of tamarind goes away. By that time, onions will get soften. 10) Now heat the oil in a small tadka pan on medium heat. Once hot add mustard seeds. Let them pop. 11) Then add cumin seeds, let them sizzle a bit. 12) Now add dried red chilies and curry leaves. Saute for 40-50 seconds. 13) Immediately add to the rasam. 14) Right away close with the lid. Let it rest covered for 5 minutes. After the resting time it is ready to serve. If serving alone, then I would recommend to strain it and drink only water part. If serving with rice then no need to strain it. Serving suggestion: Serve along with your south Indian meal. It can be served alone or served with plain steamed rice. 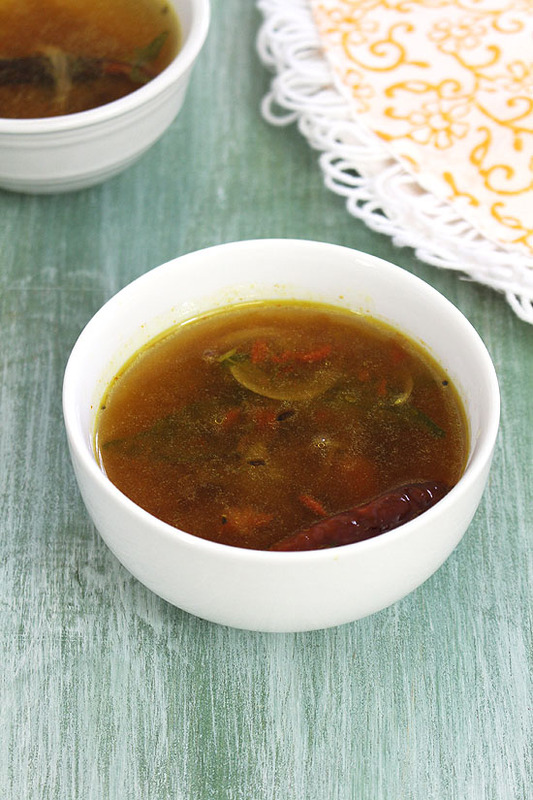 This is the simple rasam recipe made without rasam powder and made without dal. Enjoy it as such or serve with rice. 1 tablespoon Tamarind **or 2-3 teaspoons ready-made tamarind paste dissolved in water. First take tamarind in a bowl and add hot water in that. Then squeeze and extract the pulp. Strain the mixture. Using mortar and pestle, make the powder from black peppercorns and cumin seeds. Alternately you can use the spice grinder. Now take tamarind water in a pan. Add sliced onions, crushed tomato, green chili and chopped coriander leaves. Also add salt, red chili powder, turmeric powder and above prepared pepper-cumin powder. Add another 3 cups of water and turn the heat on medium. Adjust the water as per the sourness of your tamarind. So taste the tamarind water and if it is too sour then add more water, if less sour then add less water. So adjust accordingly. Let it come to a boil and then simmer for 5-6 minutes. NEVER simmer for longer period of time. It should be simmered just till the rawness of tamarind goes away. By that time, onions will get soften. Now heat the oil in a small tadka pan on medium heat. Now add dried red chilies and curry leaves. Saute for 40-50 seconds. Immediately add to the rasam. Right away close with the lid. Let it rest covered for 5 minutes. Sure, give it a try tomorrow.